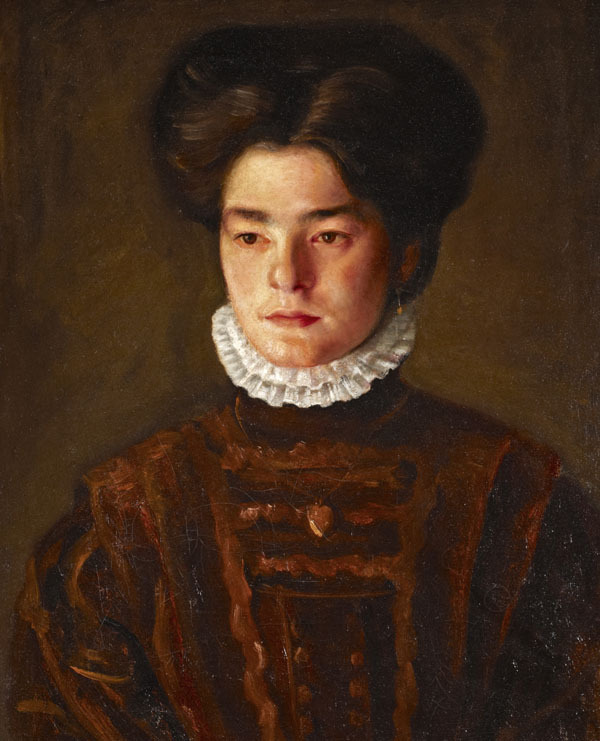 A head-and-shoulders portrait of the artist’s sister, Sophie, in full face view, her head turned slightly to the left, wearing a brown dress with white double-ruff collar and gold locket, her hair dressed up and away from the face in the Edwardian style. Sophie, eight years his senior, was one of Gertler’s favourite models – possibly due to her availability at home and readiness to sit. This is the artist’s earliest known portrait of her and his most Rembrandtesque. It probably dates from just after he began painting lessons under Philip Wilson Steer at the Slade in the autumn of 1908, where Gertler went on to complete a remarkable portfolio of family portraits. Barry Fealdman, Jewish Chronicle, 17 Sep 1976, p. ‘A bonus at the Ben Uri are three paintings by Mark Gertler, newly acquired on extended loan. [Among them] a portrait of his sister Sophie'.